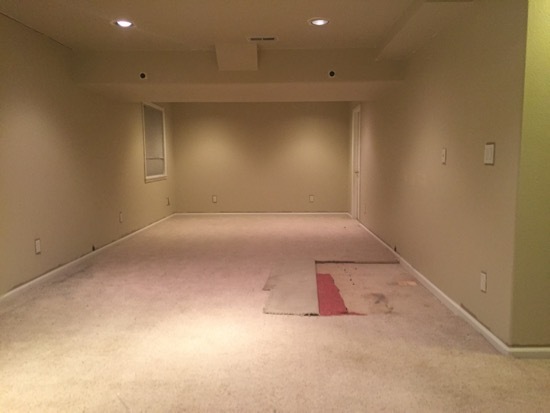 left and we have brand-new carpet in our basement! After a month of living here and not using the basement, we can now move the furniture in. So exciting! Don’t fret, I am back today with the carpet details so you can breath a sigh of relief. 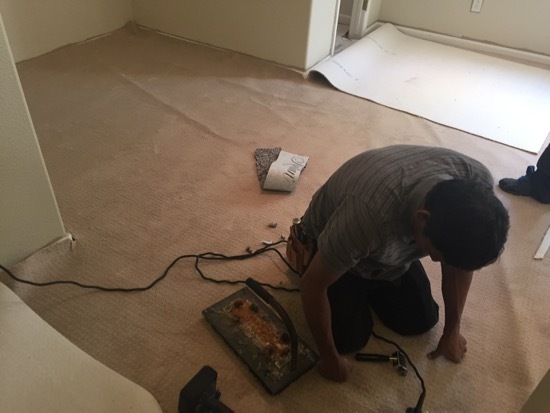 The carpet installers came in and ripped up all the old carpet and the pad. They swept the floor but it wasn’t up to my satisfaction (I’m a little bit of a neat freak) so I made them stop working while I vacuumed the entire subfloor. Yes, I used my Dyson on a plywood floor. 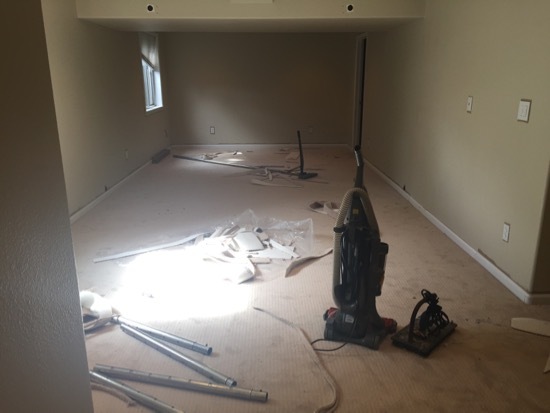 I also used the hand held attachment and vacuumed the entire perimeter of the room between the drywall and the carpet tack strip. This place will feel brand new so help me. Anyway, after they had a small break while I vacuumed, they got back to work. Obviously they laid the pad first. 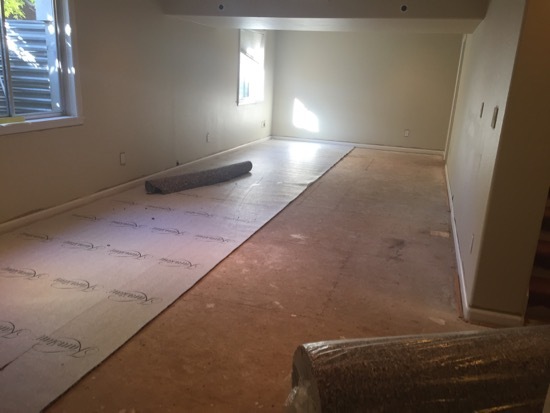 Honestly, I don’t know much about the pad except for that it was an upgrade, it’s a middle of the road pad, and it’s great for basements and subfloors because it has a moisture barrier built into it. No damp basement smells here ThankYouVeryMuch. We were able to get away with only one seam, hallelujah. The guy did a fab job on it with a heat machine of some sort. Don’t ask me, I’m not the professional. It does look great though. 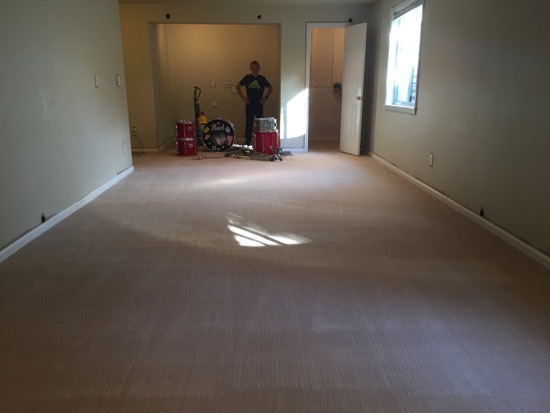 Finally, the carpet! I could just roll around on it, hug it, and snuggle with it. I wish I could re-carpet my entire house with this carpet, but money. 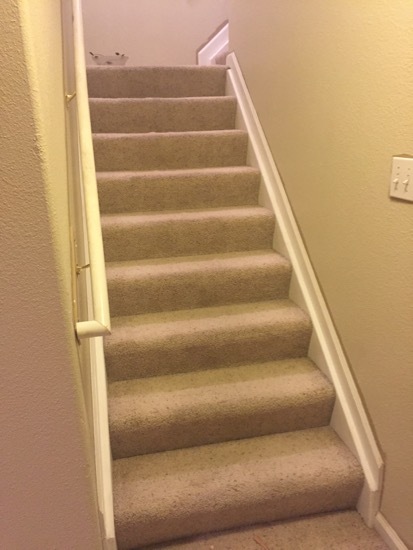 We went with a very low pile textured carpet in as light a tan color as they had. We opted for a nylon carpet instead of polyester because it’s supposedly more durable, will last longer, and won’t flatten or crush as much. When it came to picking out the carpet, I went with this one because honestly, I just liked it. I knew I wanted a low pile carpet for the basement and also I’ve really been digging the subtle patterns. 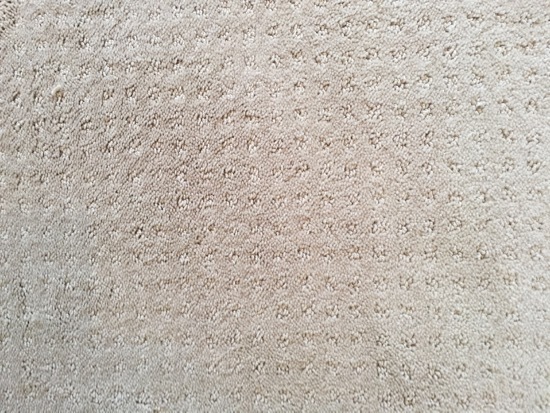 I found one at a local carpet store in Boulder (Carpet Exchange in case you live in or near Boulder, CO) and they had a low pile, textured carpet for a reasonable price, so that was that. 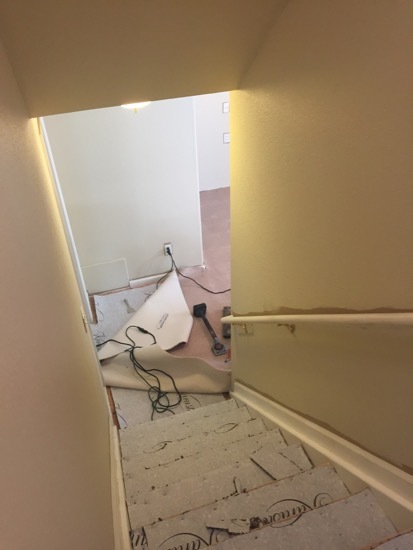 The pictures are reading a tad pink but the carpet is really just a light tan. I took the pictures with my iPhone (still need to unpack my good camera!) so they aren’t the best picture quality. Now we have a huge boring tan box and I love it. I love having a really neutral backdrop and then decorate with furniture, art, and decor to add color into the space. That way when you get sick of the look you can easily swap out accessories and voila, you have an entirely new room. 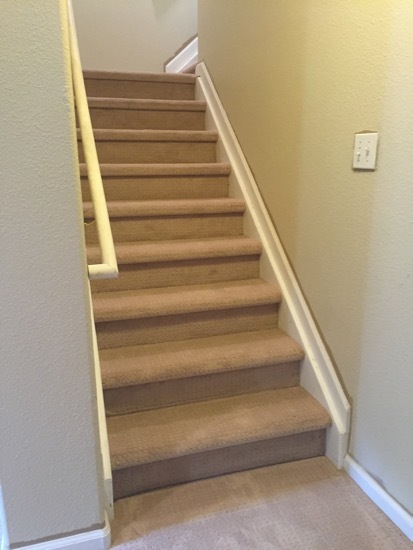 Now let’s talk about the stairs for a second. Here they are after we painted the walls (but we haven’t cut in around the edges yet). 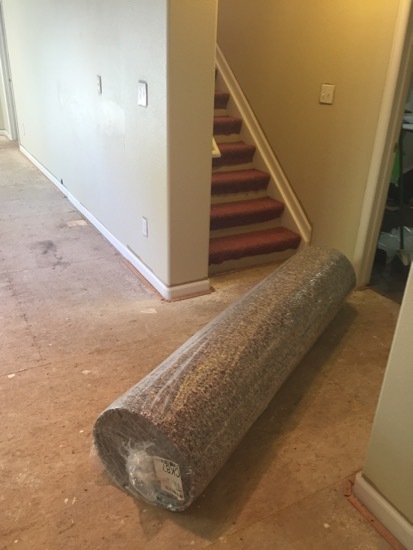 The carpet guys pulled up the old carpet and pad. 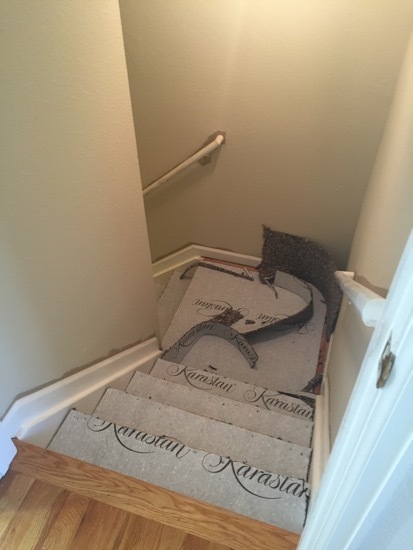 Then they cut the pad to fit along each step. 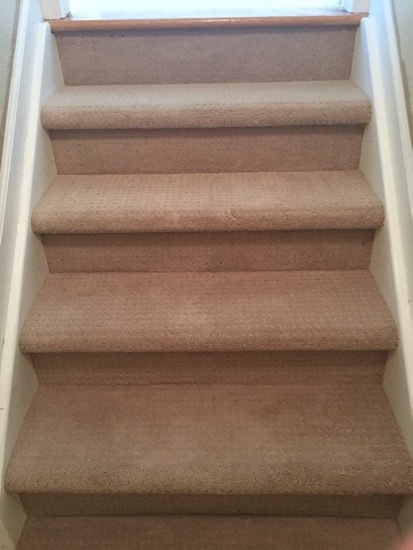 And then they attached all the carpet being careful to keep the pattern lined up. I am very happy with how they turned out. 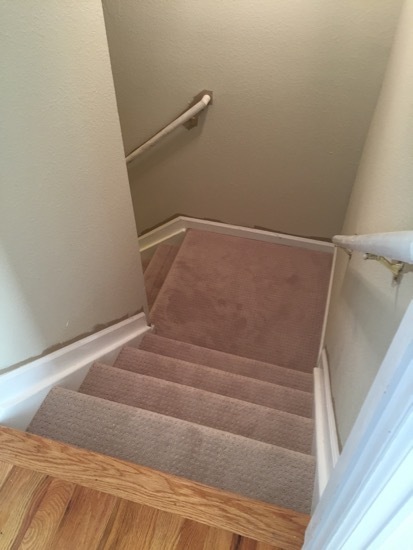 The previous carpet was not wrapped around each step, but we had this wrapped and I think it looks so much better. Here’s a good side by side comparison so you can see what I’m talking about. Now we get to bring in all the furniture! I am really looking forward to this! Good call on the nylon! My dad owned a carpet business for many years and he always recommends nylon for durability. I am digging the low-pile subtle patterns too and can’t wait until I have an excuse to replace our (perfectly fine) carpet! I love the smell of new carpet… I also like roll about on it…but that’s another story… I may be part cat. Brilliant choice! Very practical and budget friendly, especially for that size of room. Your fitter made an excellent job there. The carpet looks great! I wish I had gotten a lighter carpet for my basement. I went with a medium gray and it is fading in spots. I agree with you and Nicole on nylon. The other advantage to nylon is it doesn’t stain as much as polyester. For some reason, carpet people always try to steer me to polyester. 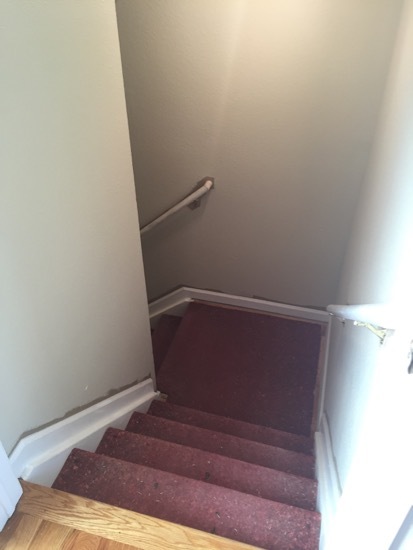 Great job….I must say the stairs look soooo much better wrapped. I love what you’ve done with the basement. 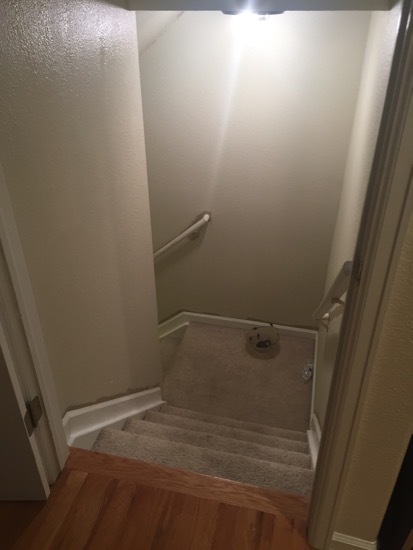 I learned with my first house to go neutral with paint, carpet, etc. and add color with easy-to-change accessories. 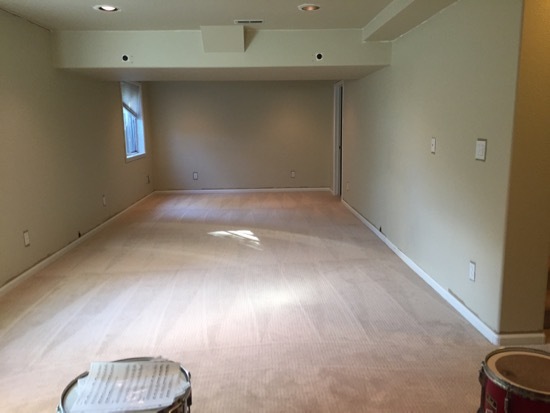 Imagine “dusty blue” carpet, countertops, etc.! Yeah, lesson learned the hard, expensive way! I can’t wait to see the rest of the house as your progress! !